Members of the United States Army Special Forces, also known as the Green Berets, look through night vision goggles during a training of Afghanistan Special Forces on Sept. 10, in Helmand province, Afghanistan. The Army's Green Berets have gained a reputation over the decades for their toughness and fighting skills. They served with local forces in Vietnam, and in recent years, they've deployed repeatedly to Iraq and Afghanistan. The list of their deployments continues to grow: Niger. Somalia. Yemen. Syria. Philippines. Now a fight appears to be growing inside the Green Beret community. An anonymous and scathing 12-page letter that begins — "Our Regiment has a cancer, and it is destroying the SF (Special Forces) legacy, its capability and its credibility" — has gone viral over the past few weeks among active-duty and retired soldiers. It charges that the Green Beret command at its Fort Bragg, N.C., school has lowered training standards and graduated Green Berets who are "markedly and demonstrably weaker; and quantifiably projecting measurable risk and liability onto the teammates with which they serve." It is signed: "A concerned Green Beret." The letter writer's identity remains a mystery at the John F. Kennedy Special Warfare Center and School at Fort Bragg. But the command does not dispute its authenticity and has responded with a letter of its own, signed by the officer who runs the school, Maj. Gen. Kurt Sonntag. It's addressed to the men and women at the school. "Many of you have seen the anonymous letter calling into question the integrity of our training standards and the quality of the Soldiers being produced. Let me be clear," Sonntag writes in his letter, a copy of which was provided to NPR by the command, "I would be proud to serve with each and every one of our Special Forces Qualification Course graduates, and I stand behind the quality of every Soldier we send to the operational force." The general went on to say that "no fundamental SF standard has been removed. No academic or character performance standards have been adjusted." NPR reached out to nearly a dozen current and former Green Berets — none of whom wanted their names used — and got a mixed reaction to the dispute. Some see the anonymous letter writer as disgruntled or lacking in sufficient experience or being unaware of the bigger picture, namely the difficulty in recruiting and retaining Green Berets. 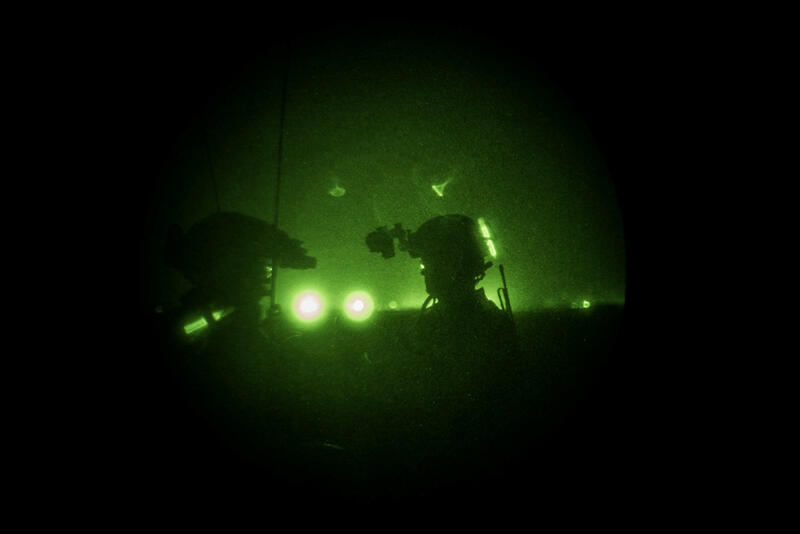 There are some 7,000 active-duty Green Berets, and officials say they could lose hundreds in the coming years because of the strain of repeated deployments and failure to meet recruiting targets. Others say the letter writer is raising some important issues. They contend that the quality of the Special Forces soldiers has decreased for at least several years. "We don't want to lose quality for quantity," said one veteran Green Beret stationed at Fort Bragg, who requested anonymity. "You can't mass produce special operators." This noncommissioned officer said that he only has a few years left to serve and that he'll stick it out. But if he had 10 more years, he says, he would opt out. He said the loss of veteran operators and the increase in less-competent Green Berets is having an impact. "It's killing morale," he said. Still, this Green Beret empathized with the command. "I see it from both sides. The recruiting pool is gone. They're in a tough spot." One Green Beret who served with Sonntag in Afghanistan praised his leadership skills and recalled him saying that all Green Berets have a responsibility to make sure every one of them succeeds. In the anonymous letter, the "concerned Green Beret" takes on physical fitness workouts — where he claims that instructors are punished for making them too hard — and says there are instances of favoritism and cheating. The author's examples of below-standard students and maligned trainers are complete with names, rank, units and dates. As far as training, the anonymous letter says students can no longer wash out for failing to pass physical tests, ranging from a 5-mile run to a 12-mile march with a heavy pack to dozens of pushups and situps. Instead, these tests became "diagnostic" to determine the student's level of achievement. The only way out of Green Beret training is voluntarily withdrawal or injury. "To say that standards have not been eliminated would be laughable, were it not so tragic," the anonymous letter states. In his letter, Sonntag defended the diagnostic approach as opposed to simply washing out a student. Such an effort gives instructors "more time to prepare the students for these events. Students must meet these standards prior to joining the operational force," the general wrote. Those who applied and passed the physical tests and assessment to become a Green Beret student, the general wrote, should be able to make it through the more than yearlong qualifying course. If such an assessment "is correct, and we believe it is, the [Special Forces Qualifying Course] is not a place where high attrition rates should occur." Sonntag declined an interview request from NPR. Instead, he agreed to address a few questions through his staff. The anonymous letter writer says one Green Beret officer during a meeting ordered a 92 percent pass rate, though Sonntag says, "There has been no graduation percentage set by any level of command." The school declined to talk about graduation rates, but one current Green Beret said his class a decade ago saw more than 50 percent fail. Sonntag did offer one statistic in his letter to the school: "In 2017, more than 2,000 Soldiers attempted the [Special Forces Assessment and Selection], and 541 graduated from the [Special Forces Qualifying Course]." But he offered no numbers on how many passed the assessment and made it into the qualifying course, so there is no sense of the fail rate. The anonymous letter writer claims there is a reason the standards are being adjusted: To bring in female candidates, a view supported by one of the Green Berets contacted by NPR. The Pentagon allowed women to apply for Green Beret training two years ago. Only a handful have tried; none have passed. But Sonntag also denies that standards have in any way been altered to bring in more female students, saying in response to an NPR question: "That is not the case. Special operations training is inclusive, and each candidate is held to the same standard." The general ends his letter to the troops by saying he wants a "healthy dialogue as a means of improvement." "Every level of command," the general writes, "has been encouraged to challenge the current process, phasing and training methodology to ensure (the school's) training remains relevant." Members of an elite American fighting force are asking if they're quite elite enough. Here's more from my co-host Steve Inskeep. The Green Berets are often first in a war zone, whether it's in Vietnam or Afghanistan or Niger, where some were killed in an ambush earlier this year. They are supposed to be trained to the highest possible standard and now face an allegation that they're not. NPR's Tom Bowman has been following this story. Hi, Tom. TOM BOWMAN, BYLINE: Hey, Steve. INSKEEP: Would you remind us what it is the Green Berets do? BOWMAN: Well, they do a number of things. First of all, it's - foreign internal defense is what they call it - basically training foreign militaries to be competent soldiers. And the other job they do is called direct action - actually going after terrorists, leading the charge, let's say, with local forces. INSKEEP: So they have to be really tough as soldiers but also culturally smart. BOWMAN: Exactly. They have language skills, cultural training. And they tend to be a bit older than your average soldier, sometimes late 20s, well into their 30s. INSKEEP: Well, who's raising questions about them? BOWMAN: Well, there is a letter - a scathing, 12-page letter that's making the rounds on websites and chat groups, and it's written by what it says is a concerned Green Beret. There's no name attached to this letter. He claims to be an instructor in the Green Berets. And he's basically saying the standards have dropped. INSKEEP: This is one of the very first sentences of the letter - the Special Warfare Center and School - that's the school we're talking about here? BOWMAN: Right, in Fort Bragg, N.C.
INSKEEP: This school, according to the letter, has, quote, "devolved into a cesspool of toxic, exploitive, biased and self-serving senior officers who are bolstered by submissive, sycophantic and just as culpable enlisted leaders." And it continues in that brutal tone page after page. BOWMAN: That's right. That's why I say it's a scathing letter. And the letter claims that standards are being lowered. People are given multiple chances to pass physical fitness exams, and it's pretty hard to fail, according to this letter writer, unless you get an injury or just decide to quit. INSKEEP: OK. First, is there any doubt that this is a real letter, given that the writer is anonymous? BOWMAN: There is no doubt. First of all, he has a lot of detail in the letter, some details as recently as several weeks ago. He mentions names of instructors, names of students - again, a lot of detail that only someone in the community would know. And the important thing is the command down at Fort Bragg at the John F. Kennedy Special Warfare School are treating it as authentic. And the general who runs the school, Major General Kurt Sonntag, has actually sent out his own letter. INSKEEP: OK. So what is the command saying about it? BOWMAN: Well, the command is basically saying these charges are baseless, that the training changes all the time and that, basically, you know, people would wash out in the past for failing certain physical tests, but now they're using these tests as what they called diagnostics, meaning they want to give them more chances to try to pass these physical tests rather than just have them wash out. INSKEEP: Because they want to work up to standard? BOWMAN: Exactly. They just want to give them more chances to get through the course. INSKEEP: Is there something larger happening here, Tom Bowman? For example, trouble in the Army and finding enough really highly-talented people to go into these Green Beret slots? BOWMAN: That's exactly what's going on here - is they're having trouble recruiting and retaining special operators. And the big reason, of course, Steve, is, as we all know, we're going into 17 years of war. These guys deploy all the time. And they also have trouble recruiting Green Berets because people realize what their future is going to be - constant deployments overseas. Now, the Green Berets say they could lose hundreds because of the recruiting and retention challenges in the coming years - hundreds out of an estimated 7,000 in the active force. INSKEEP: Which could conceivably create pressure to lower the standards. But what are you hearing when you talk with current or former Green Berets? BOWMAN: Well, I've talked to nearly a dozen former and current Green Berets, and some say, well, this guy's kind of disgruntled. Maybe he's a bit young. He hasn't been in the force long enough. But others I talk with say he raises some very good points. And one Green Beret I met in Afghanistan a number of years ago said, this guy is right on the money, that the quality of the current Green Berets isn't what it used to be. This guy's been in the force well over a decade. He said, if it were ten years ago, and I saw what's going on, I would leave. INSKEEP: That's NPR's Pentagon correspondent, Tom Bowman. And if you want to read this full letter, as well as the general's response to it, go to npr.org. Transcript provided by NPR, Copyright NPR.